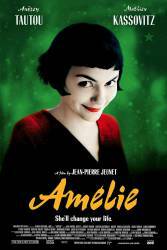 Trivia: Amelie is shot in two main thematic colours: red and green, which vary according to situations and moods. Watch it again with that in mind. Trivia: Just before Bretodeau enters the phone booth while the phone rings, he's the only one moving in real time; all other characters in the background are in slow motion. Old Man at the Two Windmills: Still, true love does exist. Suzanne, Owner Two Windmills bar: I know. After 30 years behind a bar, I'm an expert. I'll even give you the recipe. Take two regulars, mix them together and let them stew. It never fails. Bretodeau, The Box Man: Life's funny. To a kid, time always drags. Suddenly you're fifty. All that's left of your childhood... fits in a rusty little box. Chosen answer: The Glass Man isn't as reclusive as he tells Amelie; he obviously talks to many people and spies on them with his binoculars (he knows all about Amelie's revenge on the grocer and the letter she wrote to Mrs. Wells). It isn't revealed where he got the specific information about Amelie's search for Dominique Bredoteau. Question: What is the significance of the second video Amelie gives the glass man? I understand the first one - the horse is with the cyclists, and yet different from them, like the girl in the painting. But I don't get the second one. Chosen answer: As far as I can see, Amelie is just trying to give him a view of the world, so he doesn't become entirely cut off. Question: Amelie goes to visit the parents of the green grocer to find out the name of the boy that lived in her apartment in the 50's. As she arrives at the parents' house there is a very tall bridge or walkway, does anyone know its name or location? Answer: Looking at the height of the bridge, this is most likely the Aqueducs d'Arcueil et de Cachan (which is in Paris).